The District has a new study that will help in advocating for projects and funding to reduce flooding. Commissioned by the District and performed by Lockwood, Andrews & Newman, Inc. (LAN), the study provides the technical details needed to pinpoint specific projects and compete for federal funds. “Texas will be receiving $222 million in funding to help with relief efforts and the District is meeting with elected officials and governmental agencies to ensure some of that money makes its way to our area for improvement projects,” said Robert Fiederlein, the District’s vice president of strategic planning and development. 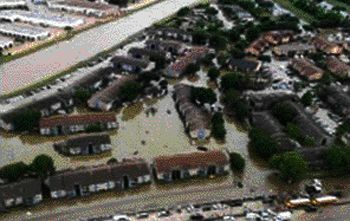 LAN modeled the April 2016 floods using state-of-the-art technology to determine how the flooding occurred in the North Houston District and why. The study identifies the area’s close proximity to Greens Bayou and the capacity of current drainage infrastructure as key factors in the flooding experienced last year. Potential improvement projects have been identified for the area as a result of the study including drainage improvements along West Hardy, Greens Road and Imperial Valley Drive. In addition, detention needed to support these projects may require the purchase of existing property in the floodway, which could open opportunities for more parks or green space in the area.